... until Marketing vanquished Engineering. 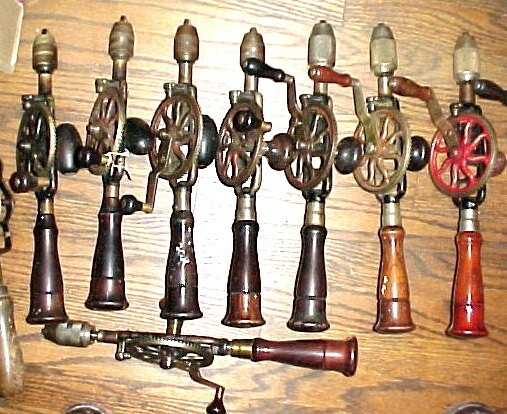 Just when we thought that all scientific discoveries had already been made, Sandy Moss came up with this find at a Spicer auction: The Type O No.2 drill. Its connection to the Millers Falls Company is circumstantial and consists only of the frame shape (but much more robust), the 1877-patent chuck and its threaded mounting on the spindle, and the numbers of teeth on the main gear (77) and single pinion (17). The gears are both solidly pinned to their shafts, and so is the crank. There is no lining on the periphery of the rather flat main gear, but the main handle is probably a replacement, judging from its sawed-off threaded shaft. Right about the time that Millers Falls redesigned the frame of the Type O drill so it could be easily chill cast in preparation for the necessary malleablizing heat treatment that made the frame both ductile and machineable, a small batch of bronze framed Type P drills and a larger batch of cast iron Type M drills were made in their machine shop, as indicated by the match markings used in the hand fitting of key parts. The frame, pinion, and spindle of the drill at left are all stamped "3". At left are the earliest types which appear in the oldest known Millers Falls catalogs. The earliest patent date I find on the chucks, for example, is August 14, 1877. 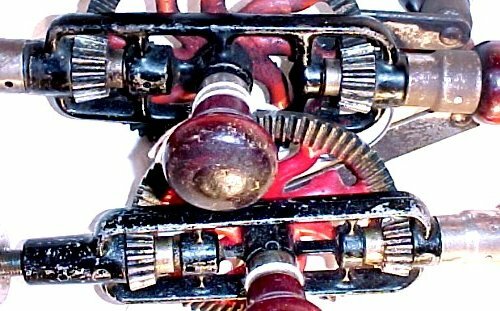 Their wrap-around frames support the main gear wheel's shaft at both ends, but do not protect the brittle cast iron (or bronze) gear against deflections from the forces acting between the teeth of the mating gears. The cast iron cranks occasionally bend but rarely break; however, they are weakly pinned to the main gear's shaft. 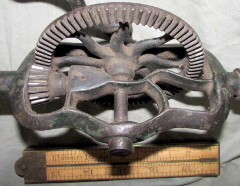 Watch for the flat face of the earliest main gears and the lining on the earliest main handles. The Type M is further distinguished by the sixteen teeth of the pinion gear. Later models in this series have seventeen teeth, a prime number, which improves the wear resistance of the teeth of the two gears because individual pairs of teeth rarely meet. 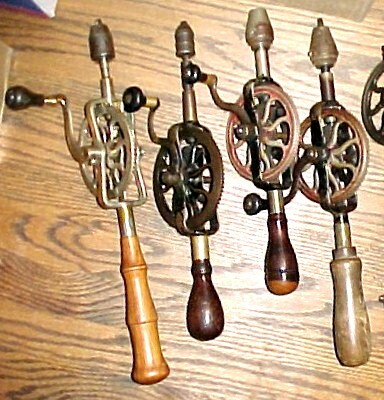 The evolution of the main handles of these types closely follow the evolution of the main handles of the early No.1, 3 & 5 eggbeater drills also made by Millers Falls. The drill on the left is Type N, followed by Type M, Type L, and an untyped mongrel. Next, Millers Falls abruptly jumped to what I think is the best designed eggbeater drill ever. A modest little flanged roller was added, outboard of the main gear, which supports the thrust that tends to push the teeth out of engagement. Millers Falls called this the "adjustable friction roll to equalize bearings" and never showed it in any of their catalog images. No one ever copied it; Goodell-Pratt tried to emulate the roller with their little hardened steel wiper, but that's as close as anyone came to adopting this innovation. I call it the "Little Rail Road Car Wheel" (LRRCW) model. The drill arranged crosswise in the picture at left is my first LRRCW drill, which I rescued as a box of bits of rusty metal and splinters of wood, which I later pieced together and polished. It's my sweetest running eggbeater drill. The LRRCW and some well-hidden ball bearings make this drill sing; it takes less effort to operate than any other drill I use. The Type F (Star logo) and Type E (triangular Since 1868 logo) are the commonest types found. About the time that the Millers Falls Company purchased the Goodell-Pratt Company and moved from Millers Falls to Greenfield, Massachusetts, someone tried out a method of adding a second pinion to support the side thrust between the main gear and the pinion gear. This was presumably in response to market pressure from other manufacturers. It is difficult to justify the change, as it almost certainly cost more to make and machine that second pinion than the roller, its cam-shaft and the adjusting screw of the LRRCW. The second pinion of this model was installed on an extension of the threaded shaft of the main handle, and the frame had to be spot-faced and threaded to accept the extra parts. I figured that this was a one-off prototype that some fortunate collector had stumbled upon or spirited away from an archival collection of the manufacturer. Not so fast, buster. Then I spotted another one in a different place. Millers Falls actually sold their research & development models - perhaps to test the market. Both examples of Type DC have the "Since 1868" triangular logo stamped on the crank. The very next Type D was made in Greenfield. One gets the impression that this was a last-gasp effort by a company being consumed ... not an improvement being developed by an energetic staff ... in spite of the fact that the record says that Goodell-Pratt was purchased by Millers Falls. Last (and least, to my way of thinking) are the double-pinion No.2's, which Millers Falls started to make some time after moving their plant to Greenfield, Massachusetts, from Millers Falls. The LRRCW was eventually ditched, and Millers Falls went to what had become the standard way of keeping the gears in mesh. Never mind that it takes a lot more work to turn a pair of meshing gears than to spin a roller (especially when neither method is supposed to be delivering any work through the process) and that the second pinion does nothing to take the side load off the main gear; that's just what the competition was doing. To make matters worse yet, all the auction action today is with the last two types in the picture at right, and the brighter and uglier the orange handles, the higher the price. Go figure. The frame of the Type O drill (far left) is the most robust of any type of No.2 drill; compare to the thinner & less massive frame of the Type Pre-L drill to its right. As both drills were fitted with the 1877-patent-date two-jaw chuck whose maximum bit capacity is only one-quarter inch, it must have seemed logical to make a more slender frame. On the other hand, this metallurgist also notes that the Type O's thick frame may have been too difficult to make as malleable iron, which demands rapid cooling of the liquid metal in the mold to achieve the necessary metallurgical state of the raw casting. The Type M drill has a tapered socket in the spindle. Earlier drills used a straight hole and set screw like a post drill. It was also match-marked during its manufacture in a batch of more than ten at a time in the Millers falls machine shop while the firm was gearing up for later, higher volume production. This is the two-jaw springless chuck patented on August 14, 1877. The jaws each had a V groove in the middle, but the opening between the jaw guides only permitted 1/4 inch bit shanks to be gripped. The minimum bit size was about 1/16th inch, not a very wide range compared to later three-jaw chucks the same outside diameter. This jaw design was also prone to losing the jaws, distorting the chuck shell, or breaking jaws because they hang out too far in order to grip the smallest bits in the range. It's better than that hollow-tapered spindle above, though. Type L2 on the left; the earlier Type L0 is on the right. The bits that the shorter handle was meant to accommodate were all the same length, but the later twist drill bits were made in what became known as jobbers lengths, meaning that the larger diameter bits were also longer, because they could drill deeper holes. The short, straight-flute bits had to be repeatedly withdrawn from the holes being drilled because they tended to clog with chips. The three parts of the LRRCW assembly are the cam (at lower left in the lower right hand portion of the composite picture at left), the LRRCW (to the right of the cam), and a lowly round-headed No.6-32 clamping screw. The exploded parts are shown in the same orientations and relative positions as in the detail view above the picture of the individual parts, but the drill itself is shown rotated 90 degrees counterclockwise from the detail view. The LRRCW should be adjusted so that it just barely allows the main gear wheel to rotate without binding anywhere in the rotation of the gears. That is done by loosening the clamping screw and then rotating the cam with a second screwdriver. A purist would tell you to orient the cam so that the frictional drag of normal rotation of the main gear will tend to loosen the fit of the LRRCW should the clamping screw lose its grip. Otherwise, just twist the cam back and forth while trying real hard not to push it in towards the rim of the main gear until everything is snug without binding. Then you can retighten the clamp screw. The function of the LRRCW is to keep the main gear and single pinion gear in correct mesh along their corresponding pitch lines, thereby minimizing backlash and ensuring accurate, smoooooth rotation under load. The LRRCW assembly is extremely stiff, so it does not perceptibly deflect under load. The shaft upon which the flanged roller (the LRRCW) rotates is quite small in diameter, so there is little friction when the assembly operates, even under load. 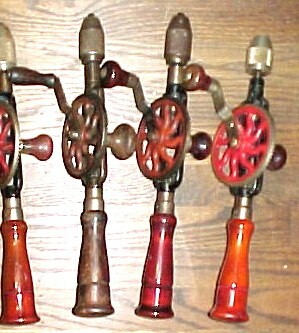 The crank handles of the Type M, Type Pre-L, Type L and the Type K2 are shown arranged left-to-right at left. 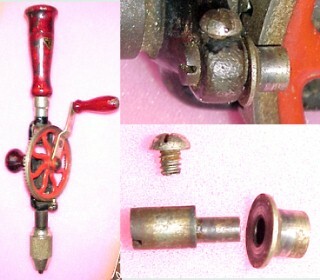 Each of the first three cranks has a boss cast in to hold the axle of the rotating crank handle, but the Type M's handle is held with a screw carefully tapped into the crank (but loosened for the camera) the Type Pre-L's crank is held with a pin apparently press fit into that boss but whose head is peened over a washer to retain the rotating handle, and the Type L's crank handle is held by a large-headed pin riveted at the inboard side of the boss, which was drilled clear through to receive the pin. The crank handle of the Type K2 was held like that of Type L, but the crank of the Type K's and all later No.2 drills are thin steel, and so their crank handles are not so securely attached as these early three drills' handles. The very first No.2 drill that used the LRRCW to control the running fit between the main gear and pinion gear had a very plain thrust bearing. That bearing supported the force of pressing the bit against the workpiece being drilled. The bearing was a simple cylinder whose position could be adjusted and held in place with a small screw visible here between the spokes of the main gear. That simple bearing was not easy to keep lubricated and had high friction compared to the efficient solution that appeared with the more heavily loaded Type K5 and later drills: a row of tiny steel balls between the upper end of the spindle and the inside of the spindle's bearing housing. The first LRRCW model of the No.2 eggbeater drill did not just spring to life fully developed. Only the LRRCW achieved that feat of inspiration, never imitated since in any hand drill that I've seen. The first frame, the Type K1's at right, was narrow and lacked any provision for a side handle. The next model, the Type K2 at left, had a wider frame, presumably stronger. I have never come across a broken frame in a No.2 drill. These frames were made of malleable iron, a ductile, tough material in its time. Later frames were made of pot metal; they didn't break, either. 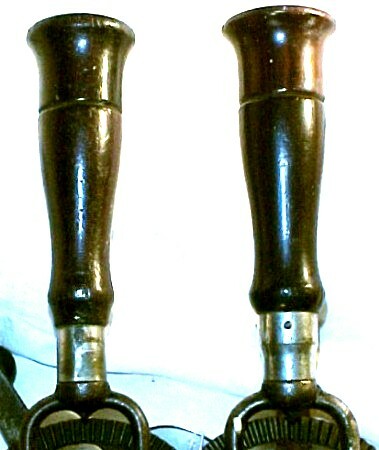 Both of the drills shown here have the cylindrical, flat-ended plain thrust bearing that was barely adequate for the small bits these drills could hold in their two-jaw, springless, 1877-patent chucks. The next model, Type K5, came with a side handle and an improved chuck, but the more important development was the addition of an invisible set of tiny ball bearings inside a redesigned spindle housing, behind the inboard end of the spindle. The Type K5's new, three-jaw, no-springs chuck is an improvement over the older two-jaw chuck, because the three jaws theoretically center the bit much more accurately than the two-jaw version did. The two-jaw chuck depended on a narrow Vee groove in the middle of each jaw to center the bit, and that was more effective for small drills than for larger ones. The patent date on this chuck is September 29, 1896. Similarly to the two-jaw version, each jaw is flat on the sides and is guided by grooves in the body of the chuck. There are no springs, so one has to wiggle the bit during insertion to move the jaws out of the way. The first LRRCW model of the No.2 drill retained the slender main-handle shape of the earliest No.2 types because the two-jaw, springless chuck could hold bit shanks no larger than 3/16ths inch diameter. The associated drilling thrust did not tax a man's grip. Later types such as the Type JI at right, carried chucks that accepted larger bits, 1/4 inch in the case of the Type JI, and so a nudge with the shoulder as well as a grip on the side handle were in order. Hence, the mushroom shape of the end cap. Type K1 is at left here. This is the protected-spring chuck design that was patented October 23, 1900. The springs that keep the jaws pulled back and pushed out against the inner wall of the shell are behind the jaws, where no amount of poking with the drill bit can get at them. Millers Falls used this design long after the patent ran its course of seventeen years. Later versions of the main handle had progressively thicker waists, but the ferrules of these later handles were made from deep drawn brass, which ought to have been stress relieved but weren't, with the occurrence of season cracking (a military term of art) as the consequence. The greater forces applied through the larger capacity chucks didn't help, either. The comparisons at left are: first, Type J and Type I, and then Type I and Type H.
Note that the Type D's frame (on top at left) now has a connection between the rear spindle bearing housing and the housing of the main gear's shaft, compared to the unconnected spindle bearing of the older Type E below. There was also a change in the shape of the side handle between these two drills, from the "doorhandle" shape of the Type E to the smaller knob, shaped much like the Type D's crank handle. Not only that, but the number of teeth in the main gear went down from 76 in the Type E's main gear to 73 in the Type D's gear; and the pinion lost some teeth as well, from 17 to 16. These changes came before the move from Millers Falls MA, to Greenfield, MA. Not only that, but the boss originally cast into the Type E's frame to hold the main gear has been replaced by an inserted steel shaft, whose threaded side-knob end can be seen at left. On the top at left one can barely see the C-clip that retains the second pinion on the main-handle stud extension of the Type DC transitional design. Also, the steel insert can be seen protruding from the central boss of the frame. This was a new feature of Type Post-E and later drills (at left). It was necessary to spot-face the surface against which the second pinion bears, similarly to the machining done during the finishing of the frame for the main pinion. In the end, this particular drill was quite unsuccessful because the main handle wobbles along with the pinion. The original LRRCW mechanism was so good for adjusting the meshing of those gears ! It isn't possible to make the stud a tight fit in the hole tapped into the frame and still assemble the pinion onto the main-handle stud. The cast iron frame used from Type M near the beginning through Type B (at left, top) near the end of development was finally replaced in Type A (at left, bottom) with a diecast frame of a zinc-aluminum alloy known as Zamak [thanks to Russell Davis for correcting me about the makeup of Zamak - GL]. Many manufacturers had trouble (unbeknownst to them) with the purity of the molten metal, with the result that the castings fell apart many years later by a corrosion-cracking mechanism. Although this was probably the alloy used by Millers Falls, to their everlasting credit, none of these diecast frames has fallen into pieces. I haven't found any broken frames made either from malleable iron or this pot metal. This is the final stage of development. The retail version of the Sogard (the purchaser of the Millers Falls drill operation) drill at right was made to a much tighter budget than was the military version at left. The military version has nicely cut, evenly spaced teeth. The retail version's teeth are notchy and unevenly spaced. Either version costs far more to make than an electric drill with greater complexity and more heavily loaded gears. Other industries have followed a similar path. About the new table below Rather than assign Type Numbers right at the beginning of this study, I'm identifying the drills that I've found to be distinguishable from each other with letters, starting with the Type A, the last in the series. I'd use thumbnails here, except that you'd not be able to tell one drill from another at that level of detail. Instead, you can simply click on one of the numbers in the "Groups" column below, and your browser will take you to the details. If this newly inverted table is confusing or too new to comprehend, the former table is retained at the bottom of this page. Click on the Group Number in the left-most column to see an individual drill. HardWood None Short tube None Threaded ? lignum vitae Long tube None Threaded Ball ? hollow RW Round, RW Short tube Egg ? About the original table below Rather than assign Type Numbers right at the beginning of this study, I'm identifying the drills that I've found to be distinguishable from each other with letters, starting with the Type A, the last in the series. I'd use thumbnails here, except that you'd not be able to tell one drill from another at that level of detail. Instead, you can simply click on one of the letters in the series below, and your browser will take you to the details. Below the single letters are some more rows, some of them with doubled-up letters. These are comparisons that will enable you better to visualize what changes were made. Each row is identified with a specific aspect of the drill or type of transition, such as a change in type of chuck, the shape of the frame, or of the handle, and so on. The original table was generously HTML-ified by Jeff Youngstrom of the OldTools list; he introduced me to the concept of "col-span" so well that I have since made the current additions all on my own.